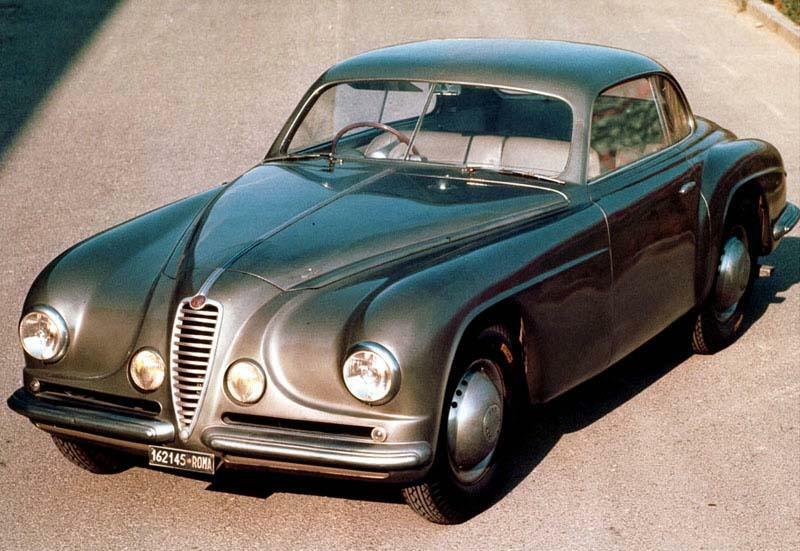 The Alfa Romeo 6C 2500 was a stop gap while the S 10 and S11 models were developed, unfortunately these never got past the prototype stage due to world war 2 and the 6C 2500 had to soldier on. 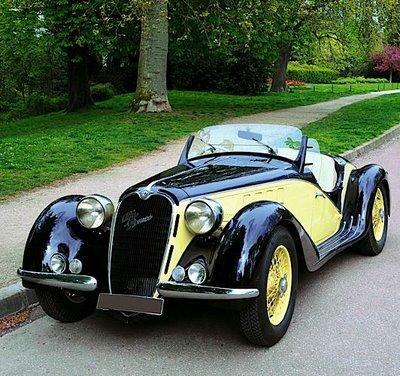 The 2500 is a development of the 6C 2300 which was designed by Vittorio Jano who was the manager of Alfa Romeos technical department in the early 1930's however when he left the company in September 1937 and it was left to Brono Trevisan to continue the master's great works. Trevisan quickly realised both the commercial and economic problems that were likely to be ahead of the company and so he began by changing the 2300 rather than replacing it, what the 2300 needed was a power increase to cope with the increasingly heavy bodies that it was having to carry. The easy way to get the desired power increase was to increase the capacity of the engine this was done by taking the bore from 70 to 72 mm and thus the 2500 was born. Trevisan kept the 7 to 1 compression ratio of the 2300 on the basic model but upped it in the sport and super sport models the chassis wheel base was also shortened from 3.25m on the Turismo to 3.00m on the sport and 2.75m on the super sport. The sport got a power increase from the turismo's 87 bhp to 95 bhp by an increase in compression ratio to 7.5 to one while the in the SS version this was up again to 8 to 1 but the SS version also improved the breathing of the engine by using triple carburettors. The engine was eventually tuned to 145 bhp in the 6C competizione where the compression reached 9.2 to 1 and it breathed through triple twin choke carburettors. The engine itself is an inline 6 cylinder with twin overhead cam shafts which were gear driven from the front of the engine, the right hand side of the engine, facing forward, is the inlet side with the left being the exhaust side. the valves have an included angle of 90 degrees and they are in a pent roofed combustion chambers. The block which contains the top half of the crank case is in cast iron while the cylinder head is made of Aluminium. The clutch is a single plate design and drives a four speed gear box with syncro's on 3rd and 4th gears, from here the prop shaft runs back to the differential via a single centre bearing. The suspension is independent all round with twin trailing arms on the front (similar to a VW Beetle or early Porsche 911) while the rear has swinging arms. 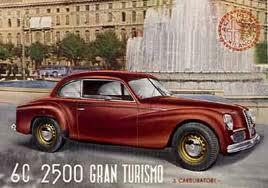 The 2500 Turismo had a top speed of just under 90 mph while the racing versions could reach 125 mph. The Sport and Super Sport variants of the 2500 are the most interesting to the modern day collector as Alfa Romeo also supplied these chassis to the Carrozzeria in numbers, some like chassis number 913.007 with a body by Stabilimenti Farina are simply stunning. In 1939 Alfa Romeo managed to produce 330 6C 2500's however through the war this figure dropped and by 1945 the factory only produced 3 cars, however Alfa Romeo managed to survive as a car manufacturer even though it was at times in the front line of the war with its factories being destroyed as part of the Allied war effort. With the coming of peace the factory had little it could do except restart production of the 2500 and by 1946 production was up to 162 and peaked in 1949 with 467 cars. The most common version of the 6C 2500 is the Freccia d'ora or Golden Arrow this was built on the 3.00m Sport chassis but had the body welded rather than bolted to the chassis, this increased the strength of the chassis and was a half way house before the introduction of the 1900's monocoque. The Freccia d'ora had very clean lines and was able to seat five or at a squeeze six people in comparative comfort, the body is a coupe with two large doors to allow easy access to the rear seats. The Freccia d'ora used the touring engine this had been slightly modified by increasing the size of the inlet valve by 1mm to 35mm to give a power output of 90 bhp this gave the Freccia d'ora a top speed of 97mph. In competition the 2500's also scored some notable successes winning the Tobruk to Tripoli long distance race in 1939 and winning its class in the 1950 Mille Miglia, not bad for an eleven year old design.